Hiya how are you? I am in a happy mood, finished work a bit earlier today, got home blitzed the house because I have some lovely ladies coming over for an AL fresco class( should have actually tidied the garden not the house LOL), yes it means that the weather forecast is actually decent so I am soo looking forward to it, never held a class outside(I will take photos of course). Today it was my turn to post a project over at Stamp With Us and this is what I come up with. A sweet little birdhouse that is actually a box, the roof lifts up to reveal a collection of 3"x3" love notes plus their envelopes, of course the box could be used for so much more, I am actually working on a gingerbread house version right now and it looks promising. Ballet Blue, So saffron designer paper, Really Rust were the colours used for the box. The owl is from the Forest friends stamp set and the branches were made with a stamp from the level 2 hostess set Spring Solitude. The little notes were made using the neighborhood wheel. All products Stampin'Up! If you would like to make this project and more you can still join in. To buy this step by step tutorial click ont he buy it now button at the end of this post. Here's a closer look at the cute little owl. This particular box was a gift for my new neighbours, last month our next door neighbours emigrated to Australia, and new ones moved in. I thought those little notes would be perfect to let friends and family that they moved or to use as thank you cards for the new home gifts they might have received. yay for weekends!! i love your house and all your creations! This is absolutely FABULOUS!!! I love what you did with the little birdhouse box. It is the perfect gift for new neighbors. I have 2 new neighbors, but no time to make something that sweet. Your neighbors will appreciate it I'm sure. TFS! I love, love, love this little house and would love to make one myself - what do i have to do? If i click on the buy it now tab at the top of your page do the instructions get emailed to me? sorry to sound like a dumbo. Oh Monica this is adorable hun, wish I was your neighbour. Have a great time today. Fabulous creations Monica, very creative. This is adorable Monica! I made something similar to this last Christmas using the scallop edge punch as shingles for the roof. I love your projects keep up the great work! OMGosh Monica, its fabulous! How clever are you, I just love visiting your blog to see what surprizes will be waiting to inspire me, I just love it!! Monica, this is a fabulous project, I thoroughly enjoyed making one and will be making many many more !!! Love it! 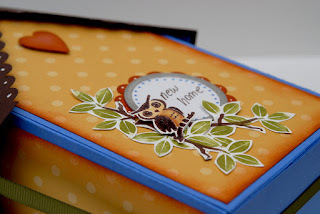 Great box and wonderful colors! How creative you are! 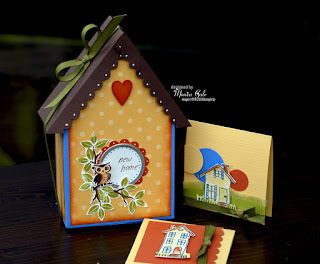 The little cottage style box (in this case bird house) is so adorable. I have not seen this stle before. Nice work. How scrummy! I love birdhouses and this is just the most lovely litte set ever! You really are so clever wth your designs - puts the projects in the catty to shame!